It is, in short, the future of work. But workplace innovation that supports flexwork can’t be achieved by departmentalized staff functions working in isolation. And yet, that’s exactly what is still happening in many organizations. Innovation requires integrated planning that assumes cross-functional collaboration and shared measures of success among human resources, facilities management, and information technology. Whenever delivery of staff support is not integrated, we fall short of adding greater value to the enterprise. When faced with implementing a telework/flexwork initiative, human resources professionals have myriad hurdles to success. Their role is not only one of legal compliance, but also change management, recruiting, employee value proposition, training, and communication. They must build the business case, and they’re often challenged to find ROI calculations to prove a bottom-line return. Even the best-executed programs suffer from leadership attention fatigue and a lack of resources. HR also finds itself simultaneously in the role of coach and hawk, helping employees and managers work through flexwork scenarios while managing non-cooperation. This necessary focus on the transactional limits the perception of HR professionals as strategic change agents. They’re often left out of the loop when telework/mobility strategies are initiated by other groups, like IT or real estate. As a result, telework initiatives and workspace redesign projects crop up completely separate from the flex program implemented by HR years earlier. Together with corporate real estate, the FM function is focused on optimizing a portfolio of properties (right space, right location, right time, right price), operating and maintaining assets, and managing costs. Traditionally, FM has focused on company-controlled premises. In a world of increasingly distributed work—where work takes place as much on company premises as it does off—the focus becomes much broader in terms of supporting work across a network of dispersed locations. This includes “third places” in between home and office. Reducing costs is surely a motivating factor; however, shrinking standard workspace footprints has its limitations when a company maintains an “everybody gets one” philosophy. While it’s certainly faster, providing less space per person is also less satisfying. Yet it’s difficult to resist this temptation while trying to satisfy greater demand for collaborative spaces. Ironically, the more collaborative space available, the less time individuals spend in their own assigned workspaces. 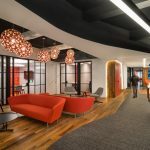 Moving toward supporting a highly mobile work culture with flexible work practices, FM teams must begin to think beyond spaces and, instead, to services that keep everyone connected all the time regardless of place. This involves rebalancing controlled assets fixed in place and variable on-demand utilization services; it clearly goes beyond “facilities” in the conventional sense. In many cases, IT departments are seen as tactical, not strategic. This must change as executives focus on attracting talent and the CIO’s agenda is reset by the expectations of a new generation of workers. A wave of disruptive technologies has coincided with economic shifts that will transform IT departments. Adoption of these new tools helps companies achieve greater flexibility at lower costs. Cloud computing, smart devices, and mobile technologies are all present, inexpensive, and reliable. Today, if an organization has the vision to automate to extraordinary levels, everything they need is available. This “post-PC era” must be supported by a new IT business model. Enterprises adopting flexwork as an operating strategy must re-orient their HR, FM, and IT toward cross-functional integration. The enterprise in this stage doesn’t distinctly recognize flexwork at any level in the organization. The enterprise recognizes flexwork as an effective cost-reduction initiative at a department level. The enterprise recognizes flexwork’s potential to support organizational objectives. Budget sharing in support of flex initiatives has begun. The enterprise recognizes flexwork as a core business strategy for both controlling expenses and attracting and retaining talent. By better understanding the maturity road map for organizations on the flex journey, then HR, IT, and FM professionals can work together to identify collective goals that reinforce individual values and rewards. Institutionalized flex is impossible to achieve without the collaborative efforts of these three groups. Yet, it’s crucial for the growth and sustainability of American enterprise. Terrific article! Please let me know if/when we can connect for a live conversation. My company, LiquidSpace, is working with Enterprises to support their progress down the path of adoption that you outline. LiquidSpace is one of the disruptive technologies you reference. We are putting workPLACE decisions in the palm of employees’ hands and equipping CRE and Workplace Managers with tools to observe and guide. I’m confident that we’ll have a rich exchange of ideas and perhaps there are opportunities to collaborate. Hope to speak soon. I do hope you are able to connect with Mark of LiquidSpace. We currently have 3500+ members of our organization using the LiquidSpace platform to find and book their workspace. The users love the convenience, but just as important, our Managers can track when & where space is being used! The internal reporting is the (formerly) missing link that now provides a useful tool for the users AND enterprise.